Located It is located at 21.68°N 87.55°E. It has an average elevation of 6 metres (20 ft). 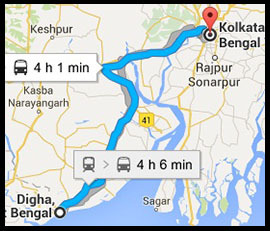 It is located 183 km (114 mi) from Kolkata via Mecheda and 234 km (145 mi) via Kharagpur, this proximity has probably helped this small hamlet to emerge as a popular weekend getaway with number of good hotels and tourist lodges. Digha is connected to Kolkata/Howrah by a highway and a rail-link via Tamluk Digha's old beach is not as wide as it used to be due to heavy soil erosion. Big stones and concrete steps are used to hold together the beach. Another problem is the record number of tidal waves that have caused many of the unplanned shacks and smaller hotels to succumb to the sea. 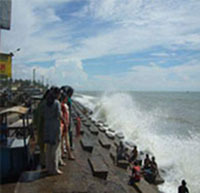 Since it is one of very few popular beaches in West Bengal, it gets overcrowded, especially during the cooler winter break.